Kirklees butcher and Meat Management contributor, Brindon Addy, has been honoured by his peers in Ireland. In his high profile role as chairman of the national Q Guild of Butchers, Brindon, who runs J Brindon Addy Butchers in Hade Edge, Holmfirth, was invited to visit the country by Associated Craft Butchers of Ireland (ACBI). Brindon Addy, left, receives his Associated Craft Butchers of Ireland honorary membership certificate from celebrity chef Neven Maguire, joined by Hugh Maguire, president of Associated Craft Butchers of Ireland, and CEO John Hickey, right. The certificate is now proudly on display in the Hade Edge shop. During his trip, Brindon was awarded honorary certified craft butcher status, as the industry-leading body launched its new certification scheme. Over a hectic four-day schedule (Sept 10-14), Brindon spoke about the Q Guild at the ACBI’s annual meeting in Ashtown, Dublin, also participating in a group discussion between members at Waterford Institute of Technology, joined by Neven Maguire, one of Ireland’s best-known celebrity tv chefs and ACBI ambassador. 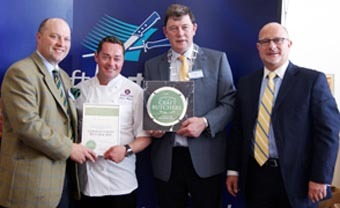 At the same venue, Brindon was also among the judges at the Craft Butchers Young Butcher of the Year Awards, later presenting awards at a ceremony staged at Waterford Crystal’s headquarters to the top three young butchers, where he again teamed up with Neven Maguire.